I make a lot of these little d20 necklace dragons. Most of them are just chilling with their die, either napping or guarding their precious treasure, but for this one, the client requested a little something extra. I've never made a crown that small before, and it took a couple of attempts, but I really like the result. A coat of gold pearl-ex really helped to give it that metallic shine. 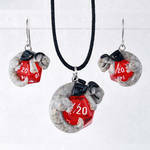 Crafted from polymer clay, Jacquard Pearl-ex pigments and a d20. 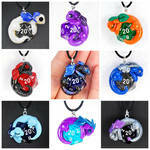 Want a customized baby d20 necklace dragon of your own? You can get one right here. 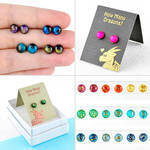 Want to see how my dragons come to life? I'll be streaming tonight, from 7-10pm Pacific. As always, you are invited to stop by and say hi over on Twitch. We'd love to see you! i cant believe you make these! I'm in love with this one too, it's so beautiful and cute! I'm so happy to hear it, thank you! Omg, I would love one of these. I'm a huge D&D geek. Daw, I love these designs. The sleeping dragons always look adorable . I like how you complimented the shimmery metallic looking body with the black wings/tail/horns. It adds a subtle but nice depth to the dragon and makes the golden crown really stand out. Well, I think you're colourful dragons are always gorgeous . Just love these little guys, this one is so cute! Great job!